By now, it’s no news that, despite e-books, online content and social media, the death of print books has turned out to be greatly exaggerated. In fact, according to Nielsen BookScan data (point of sale data from booksellers representing most of the U.S. market), print book sales increased 3.3% in 2016 — the third consecutive year of sales growth. Further, books are the largest and fastest-growing physical media category (larger than DVDs/BRDs and CDs combined), and the third most-gifted general merchandise item (after gift cards and clothing), pointed out Mike Hesselbach, EVP and chief marketing officer at ReaderLink Distribution Services, in an overview of the book market during the 2017 Magazines & Books at Retail Conference. Hasselbach summarized sales trends — including print versus e-books data — and shared merchandising and marketing techniques that are effective in an increasingly fragmented and challenging retail environment. 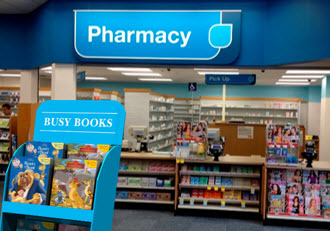 The continuing stream of new book releases and children’s and young adult franchises that drive licensing spin-offs and broad consumer awareness have been key contributors to books’ continued health, Hesselbach noted. According to Association of American Publishers/AAP data (based on reporting from 1,200 publishers), total print and e-book trade-channel sales were $6.1 billion through November 2016. Print accounted for $4.8 billion (up 3.1% versus 2015), or 79% of the total. E-book sales declined from $1.2 billion to $1 billion during the same period. Sales of adult mass market titles have been declining in recent years, but AAP’s data show them rebounding somewhat in 2016 — up 2.8%, to $296 million. An infusion of new authors helped drive last year’s results, according to Hesselbach. Adult trade paperback sales rose 6.6%, to $1.4 billion. However, adult hardcover sales declined 4.5%, to $1.4 billion. Sales of adult coloring books, which were phenomenal in 2015, increased again last year, but at a slower rate, he reported. Kids’ books continued to show strong growth, rising 9%, to $1.6 billion. 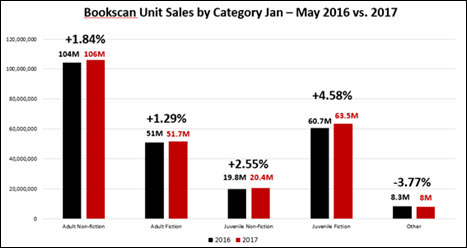 This year, through May, Nielsen BookScan data show print book sales up 8%, with juvenile fiction seeing the largest gain (4.6%), adult nonfiction up 1.8%, and adult fiction up 1.3%. In contrast to the sales trends for music and video, consumers preference for print books over e-books is clear, Hesselbach stressed. 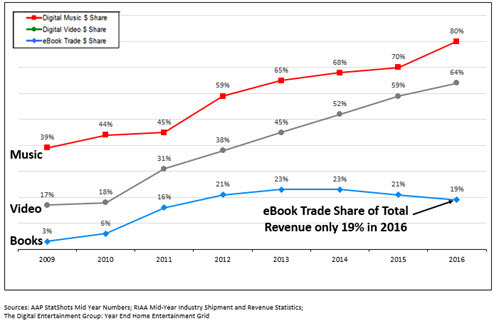 E-books' share of total book sales peaked at 23% in 2013, but declined to 19% by last year. E-books' share of market has declined 13% since 2015. Hesselbach pointed to Deloitte’s 2015 TMT (technology, media and telecommunications) Predictions report as background for why print books have endured and given e-books a run for their money. The report confirmed that while Millennials avoid physical CDs, DVDs and print newspapers, they prefer print books to e-books. In fact, Millennials report that 10% of their annual media budgets, on average, are spent on books. Beyond Millennials, the share of Americans overall who’ve read a book in the last year is largely unchanged since 2012, and more Americans read print books than read e-books or listen to audio books, according to Pew research. Other Pew stats: Nearly four in 10 Americans read print books exclusively, while just 6% are digital-only book readers; and more than 66% of the U.S. population has read a print book in the last 12 months. Mass market and trade paperbacks face essentially the same challenges as magazines in the shifting retail environment, Hesselbach noted. 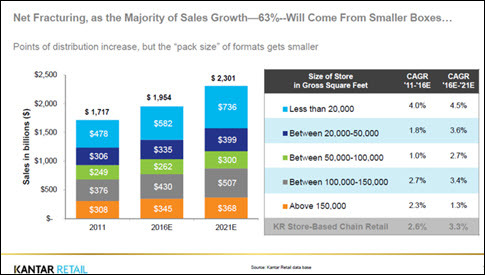 These include greater difficulty in maintaining category display space due to the trends to smaller store formats (chart below) and retailers reducing center-store space in favor of store perimeter expansion for fresh food. In addition, the growth of online shopping and click-and-collect-in-store purchasing — including in the grocery sector — continues to decrease shopping trips, physical store traffic, and opportunities for impulse-driven categories to clinch sales. *Cross-product, cross-department merchandising. While not a new concept, in a smaller-store environment, outposting books so as to feature them near related or relevant products is critical in countering the effects of reduced foot traffic, he said. "Slimline" fixtures offer opportunities to expand out-of-department placements without taking space from other products, he noted. 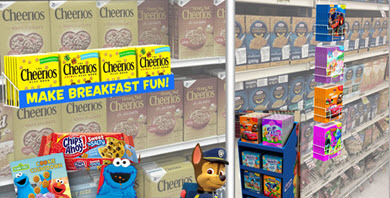 Children’s licensing tie-ins are compelling reasons for retailers to provide additional outplacements and build awareness next to grocery staples. In addition, tie-ins with other CPG products can provide incremental space in high-traffic areas. Seasonal/vacation-area stores have numerous opportunities for creative outplacements and cross-merchandising in a variety of categories. *Integrating books into in-store pick-up programs. Books should be integrated into the shopping experience within the in-store pick-up model. ReaderLink is working with retailers to create an in-store pick-up offering of bestsellers, including “Book of the Month” and evergreen children’s titles, to keep customers engaged in the category, Hesselbach reported. A limited selection will allow retailers to merchandise the titles online and make finding the appropriate titles easy for in-store personnel. *Focusing on seasonal outplacements. “Chains participating in seasonal or holiday-focused book programs, whether Valentine’s Day, Easter, Halloween, back-to-school or Christmas, see sales lifts ranging from 22% to 40%,” he reported. “Books are a perfect fit for seasonal programs because of their gifting popularity.” Given the shorter, more directed store visits due to in-store pick-up, seasonal book products merchandised in key areas to maintain visibility provide additional sales opportunities. Seasonal aisle outplacement is the best opportunity to drive incremental sales in smaller stores, according to Hesselbach. *Creating book program tie-ins to align with retailers’ corporate initiatives. Health and wellness initiatives, in particular, represent significant opportunities in drug and grocery channels, he said. *Online opportunites. Hesselbach encouraged publishers to investigate ReaderLink’s B2C book fulfillment platform to support online print book programs.